Data for this activity will be stored in L1 and L2. ENTER to set up Stat plot 1. Set up your stat plot to look like the one at the right. Then press the ZOOM key and choose option9:ZoomStat. To find an equation that matches the data you see, you need to perform a regression on the data. Press the STAT menu and arrow to the right to the CALC menu. Choose the option that most closely represents the appearance of your data. For example, if your data looks linear, choose 4:LinReg (ax+b). 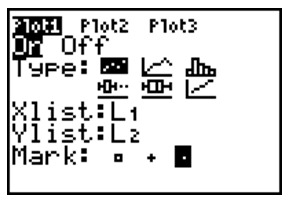 Type L1, a comma, L2, then the VARS button, arrow over to Y-VARS, choose 1:Function, the 1:Y1 option, then press ENTER. When you press the GRAPH button a line/curve that matches your data points will also be in your viewing window. Pressing the Y= button will give you the equation of that line/curve.